Free Shipping Included! 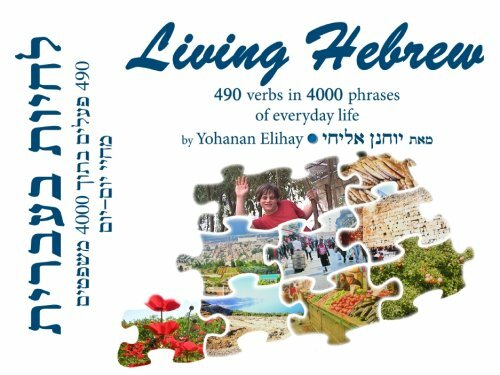 Living Hebrew 490 verbs in 4000 phrases of everyday life (text with audio CD) by Minerva Instruction and Consultation at Diaries Letters Stories. Hurry! Limited time offer. Offer valid only while supplies last. You finish the ulpan, you begin speaking Hebrew - only to find yourself stumbling over each verb. Hebrew is an easy language with difficult verbs. You finish the ulpan, you begin speaking Hebrew - only to find yourself stumbling over each verb. Hebrew is an easy language with difficult verbs. This book and the accompanying discs allow you to hear 4,000 every-day phrases, which cover all the different Hebrew verb-forms, in order of ascending difficulty - from the simplest (No 1) to the most complicated (No 490). One page a day and in 4 months you swill be using the verbs with ease. You will also have heard thousands of words and useful phrases - which you might otherwise only come across here and there, over several years. The course also exist in a version for French and Russian speakers, thousands of whom have already profited from using the book - which will remain a handy companion for years to come. If you have any questions about this product by Minerva Instruction and Consultation, contact us by completing and submitting the form below. If you are looking for a specif part number, please include it with your message.